Heat Treatment For Bed Bugs: Does It Work? Just how does the average consumer really know what they are buying or what service they are truly getting? It requires a little research. Make a few phone calls, talk to the company about there process, ask for references and read online reviews. A while back we wrote about deceptive advertising - well worth a quick read! Find our more here. Finding bed bugs is not the end of the world! There are bed bug extermination options that work, and then there are bed bug treatments that don't work. Do your research and utilize a company that will back there work with a guarantee for 100% bed bug elimination; not just treatment. So How Come My Las Vegas Pest Control Company Does Not Treat for Bed Bugs? Panicked or Confused about Bed Bugs? Bed Bug Extermination: Why Do I Need A Bed Bug Warranty? Really Cheap Bed Bug Spraying in Las Vegas! Jack of all Trades, Master of Bed Bugs. Definitely Not! So Just What is a Bed Bug Specialist or Bed Bug Expert Anyway? Killing Bed bugs with bed bug heat treatment Las Vegas - What you need to know! This article is published with experience you can truly trust! When Free Really Isn't Free: It's A Psychological Thing! A Friendly Local Las Vegas Bed Bug Reminder: Do It Right The First Time! Bed Bugs, Landlords, Property Management and Tenants, Who's Responsible? I'm Waking Up With Bite Marks, What Are They From? 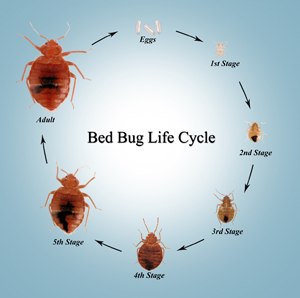 Have a Bed Bug Question: Call K-9 Sweeps at 702-586-5179. The ONLY Las Vegas Pest Control that detects and eliminates just one pest in Southern Nevada - - Bed Bugs. Are Free Bed Bug Inspections Really Free? How Do I Get Rid of Bed Bugs in Las Vegas? What Do I Do When DIY Bed Bug Treatment Doesn't Work? Bed Bugs or Chimney Swift Bugs? Restifo, owner of a company called K-9 Sweeps, brought Sara to Las Vegas in December. Since then, she has put her unusual skills to use in homes and businesses throughout the valley. Bedbugs are tiny parasites that inhabit beds, carpeting, furniture of both the fabric and wicker variety, and any other surface that offers them access to human hosts. Once they find one, they'll feed on its blood. The result, in many cases, is itching and a reddish skin rash.